Cod liver oil is a frequently recommended home remedy for many different health benefits. There is some evidence to these claims, but there are also a few concerns that people should be aware of before they begin taking cod liver oil. You need to make sure that you are taking cod liver oil in the proper dose for the ailment you are treating and your body size to avoid uncomfortable side effects and getting the maximum benefit out of the product. Cod liver oil is an omega-3 fatty acid that is found in fish. It is known by many other names, which are included, but not limited to polyunsaturated fatty acids, liver oil, fish liver oil, huile de morue, N-3 fatty acids, halibut liver oil or simply omega-3. 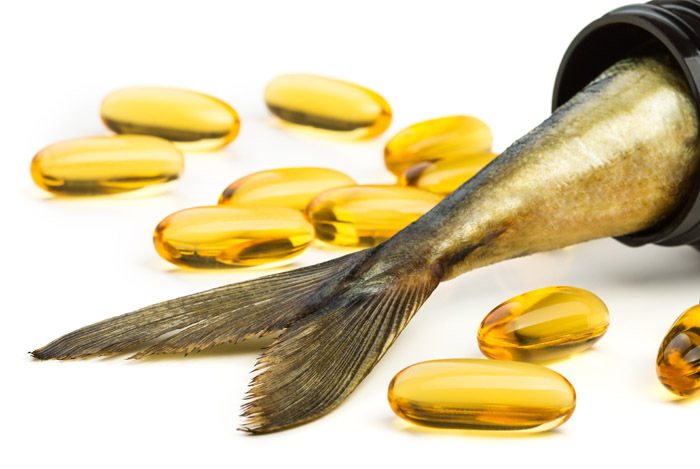 Fish oil has often been referred to as "brain food" because it has been used to help treat brain conditions such as mental disorders or Alzheimer's disease, but it can also be used to treat things such as asthma, heart conditions or during pregnancy. You can increase your intake of cod liver oil by eating fresh fish products or by taking a supplement. Supplements may be found in a capsule or in a straight oil form depending on whether or not you would like to consume the oil straight or combine it with other foods. In addition to being a key method of taking in omega-3 fatty acids, there are several other vitamins and acids that are important to quality body function. Fatty acids have anti-inflammatory properties that can reduce stress, allergy reactions, asthma, and improve the function of the brain, which includes the reduction of behavioral disorders or bipolar syndrome. Cod liver oil also contains eicosapentaenoic acid which improves cardiovascular health and has anti-inflammatory properties. There is also a healthy dose of docosal-hexaenoic acid which improves eyesight, skin and the nervous system, vitamin A which helps the body fight off infections while improving eyesight and skin, and vitamin D which assists in calcium intake to help maintain skeletal health. For arthritis- Many people take doses of cod liver oil to assist in arthritis treatment. The anti-inflammatory properties of this oil can help reduce some of the swelling that can cause pain. Those using the liquid form of this oil can take 1-2 teaspoons each day, but this may differ for those who are taking capsules. Always read the directions on the packaging of any new supplements you are taking to ensure that you are aware of the proper dosage. Similar doses can also be taken for general muscle aches or pain throughout the body. For high cholesterol and heart disease- Those with high cholesterol or who are at risk for developing heart disease can see benefit from taking cod liver oil regularly. The omega-3 fatty acids help you reduce the "bad" cholesterol in your body while improving levels of "good" cholesterol which allows for easier blood flow. Those who are using cod liver oil to treat these conditions should take 1-2 teaspoons of the oil daily. For mental conditions- These including Alzheimer's disease, psychosis, attention deficit-hyperactivity disorder (ADHD), or bipolar disorders can see a reduction in symptoms when using cod liver oil. Taking 1-2 teaspoons per day can help patients increase the tolerance of their current medications as well as assisting those who are at risk for developing mental conditions like Alzheimer's disease. For children and pregnant women- Cod liver oil has been shown to greatly reduce the risk of children developing type I diabetes. Pregnant women often take 1 teaspoon of cod liver oil each day to gain this health benefit. However, you should always discuss any supplements you plan to take with your doctor to ensure that they will not counteract with any other medications or supplements you are taking. Not everyone can enjoy the cod liver oil benefits. Cod liver oil can be used by healthy people to help reduce their risk of developing a specific condition, as well as those who are already dealing with a mental or physical disorder who require relief of their symptoms. Adults, elderly patients and children may use cod liver oil, but they may need to adjust their dosing based on their size and overall health. Consult your doctor before you start using cod liver oil regularly to help avoid a potentially dangerous reaction. It is not recommended that any patient take more than 2 teaspoons of cod liver oil daily to ensure that they do not take on an excessive amount of vitamin A which can lead to bone weakness. Some pregnant women use cod liver oil, but some doctors see this as a risk. Excessive amounts of cod liver oil can increase the risk of birth defects due to the excessive amounts of vitamin A. Taking high amounts of fish oil may increase your risk of bleeding because omega-3 fatty acids reduce your risk of blood clotting. Those who are already at risk of bleeding or those with liver disease should be aware of this risk before they start taking full doses of this medication. Some patients also report belching, nausea, loose stools, nausea, rash and nosebleeds while using cod liver oil. Freezing capsules before taking them or combining your dose with meals can help reduce the risk of developing these side effects. In some cases, taking high amounts of cod liver oil may make your symptoms, including blood pressure, bipolar symptoms or depression worse. Start with low doses of this supplement and work up to a full dose to help avoid this reaction and to help determine whether or not you are at risk for developing a negative reaction to cod liver oil.